Leukocyte-specific protein 1 (LSP1), is a calcium-dependent F-actin binding protein and a major downstream substrate of p38 mitogen-activated protein kinase as well as protein kinase C. LSP1 plays an important role in leukocyte chemotaxis. During T cell maturation, expression of LSP1 is low on immature CD4+CD8+ double positive thymocytes, but is highly expressed on mature single positive CD4 and CD8 T cells. Distribution: Localized to the cytoplasmic leaflet of the plasma membrane. Function: Contributes to lymphocyte and neutrophil activation and chemotaxis, as well as lymphocyte differentiation. Regulation: Phosphorylated by casein kinase II, protein kinase C and MAPKAPK2. Interaction: F-actin, Casein kinase II, PKC, MAPKAPK2. Carbohydrate-specific signaling through the DC-SIGN signalosome tailors immunity to Mycobacterium tuberculosis, HIV-1 and Helicobacter pylori. Nature immunology 2009 Oct 10 (10): 1081-8. 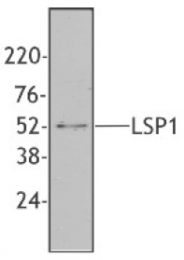 Western Blot analysis of LSP1 expression in transfected 293T cell line by LSP1 monoclonal antibody (M07), clone 1C4.Lane 1: LSP1 transfected lysate(37.2 KDa).Lane 2: Non-transfected lysate. 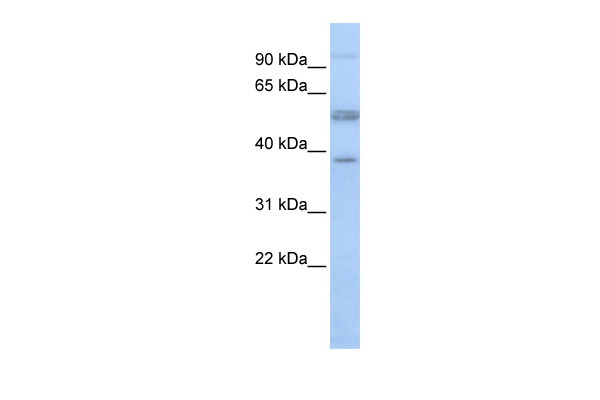 Western Blot analysis of LSP1 expression in transfected 293T cell line (H00004046-T01) by LSP1 MaxPab polyclonal antibody.Lane 1: LSP1 transfected lysate(37.29 KDa).Lane 2: Non-transfected lysate. 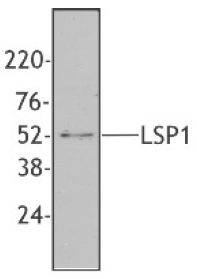 Western Blot analysis of LSP1 expression in transfected 293T cell line (H00004046-T01) by LSP1 MaxPab polyclonal antibody.Lane 1: LSP1 transfected lysate(37.20 KDa).Lane 2: Non-transfected lysate. 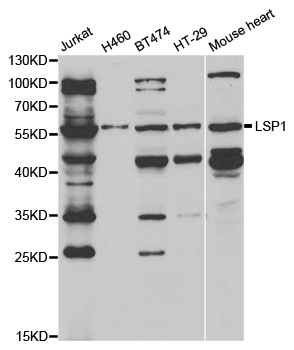 The whole cell lysate derived from m-CSF stimulated Jurket cells ( lane 1 ) or mouse spleen ( Lane 2 ) were immune-probed by LSP1 ( phospho S252 ) polyclonal antibody ( Cat # PAB12633 ) at 1 : 500. An immunoreactive band is observed around ~ 52kDa. The tissue lysate derived mouse spleen was immune-probed by LSP1 polyclonal antibody ( Cat # PAB12702 ) at 1 : 500. An immunoreactive band is observed around ~52kDa. Immunoprecipitation of LSP1 transfected lysate using anti-LSP1 MaxPab rabbit polyclonal antibody and Protein A Magnetic Bead (U0007), and immunoblotted with LSP1 MaxPab mouse polyclonal antibody (B01) (H00004046-B01). Antibody (AP23727PU-N)(1µg/ml) staining of Peripheral Blood Lymphocytes lysate (35µg protein in RIPA buffer). Primary incubation was 1 hour. Detected by chemiluminescence. 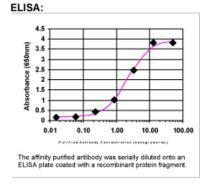 Cell extracts from THP-1 cells were western blotted with anti-LSP1 Antibody Cat.-No AM33059PU-N (Clone 5E3). Immunohistochemistry: LSP1 Antibody - Immunohistochemical staining for lymphocyte-specific protein 1 (LSP1) in human lymphoidal tissues. Lymphoid tissues of lymph nodes displayed moderate to strong cytoplasmic positivity. Normal epithelial and stromal cells were negative. Most malignant lymphomas and a few cases of urothelial cancers expressed moderate cytoplasmic immunoreactivity (images not shown). These image are the courtesy of the Human Proteome Resource (HPR). 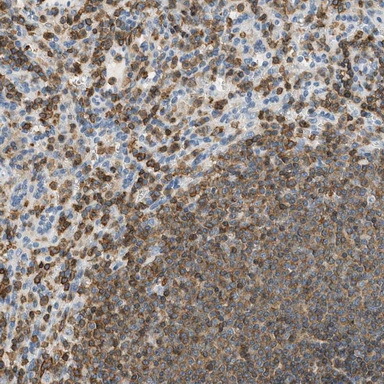 Immunohistochemistry: LSP1 Antibody - Immunohistochemical staining for lymphocyte-specific protein 1 (LSP1) in human lymphoidal tissues. Lymphoid tissues of appendix displayed moderate to strong cytoplasmic positivity. Normal epithelial and stromal cells were negative. Most malignant lymphomas and a few cases of urothelial cancers expressed moderate cytoplasmic immunoreactivity (images not shown). These image are the courtesy of the Human Proteome Resource (HPR). 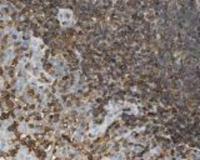 Immunohistochemistry: LSP1 Antibody - Immunohistochemical staining for lymphocyte-specific protein 1 (LSP1) in human lymphoidal tissues. Lymphoid tissues of tonsil displayed moderate to strong cytoplasmic positivity. Normal epithelial and stromal cells were negative. Most malignant lymphomas and a few cases of urothelial cancers expressed moderate cytoplasmic immunoreactivity (images not shown). These image are the courtesy of the Human Proteome Resource (HPR). 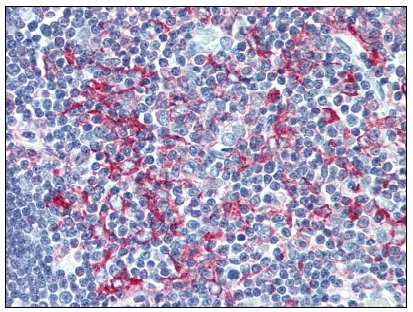 Immunohistochemical staining of human spleen shows strong cytoplasmic positivity in lymphocytes.This validation was performed by Protein Atlas and the presentation of data is for informational purposes only. 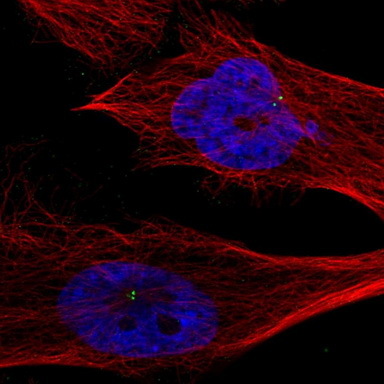 Immunofluorescent staining of human cell line U-251 MG shows positivity in centrosome.This validation was performed by Protein Atlas and the presentation of data is for informational purposes only. (0.05ug/ml) staining of Human Liver lysate (Lane 1), Mouse Liver lysate (Lane 2) and Rat Liver lysate (Lane 3) (35ug protein in RIPA buffer). Primary incubation was 1 hour. Detected by chemiluminescence. (0.05ug/ml) staining of Human Peripheral Lymphocytes lysate (35ug protein in RIPA buffer). Primary incubation was 1 hour. Detected by chemiluminescence. 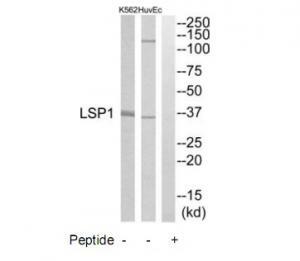 Western blot analysis of extracts from HuvEc cells and K562 cells, using LSP1 antibody.The lane on the right is treated with the synthesized peptide. 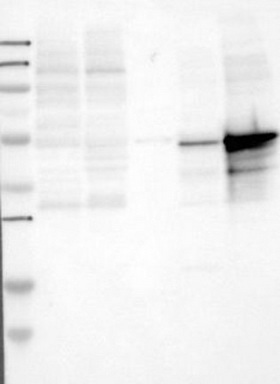 Western blot analysis of extracts of various cell lines, using LSP1 antibody.